Week after week, I am overwhelmed by the sheer number of interesting events happening in Detroit. As I scroll through Facebook, I’m constantly shown events that my friends are attending or interested in. For a long time, I became too overwhelmed by my options and gave up on trying to make choices and schedule the time to attend anything. Recently, as I was reassessing my personal goals and organizing action items associated with each, I decided that I needed to make a real commitment to checking that “going” button…and actually following through. Between working, volunteering, the fellowship and my personal life, taking time to invest in myself is challenging. Adding another responsibility into the mix is never easy (just ask my gym membership), but in the coming months I’m going to do my best to make the time and work it into my routine, knowing that eventually it will become natural. A majority of my current goals revolve around my career and/or professional development, so I really wanted to focus on taking advantage of some of the various workshops that are offered around the city. Challenge Detroit has given me the opportunity to engage with so many incredible organizations and individuals; one of the many things I’ve learned through that engagement is that Detroit is overflowing with extremely knowledgeable people who are experts in their field and/or passion. I couldn’t keep passing up my chance to continue that engagement outside of Challenge Friday’s. Not to mention: in my hometown, affordable, uncomplicated workshops and other means of professional development are hard to come by. I mean, a huge draw of moving to a bigger, better city is the bigger, better resources, right? It’s BEEN time to starting taking advantage of them. I’ve managed to attend two workshops in the weeks since I’ve set this goal for myself. Unsurprisingly, I was impressed by both events. Both were hosted at Bamboo Detroit, a neat co-working space that I pass on my way to work each day, but had never been inside or even looked into. The first was Building Your Bio, which was hosted by Detroit Young Professionals. The title is relatively self-explanatory: we were coached through professional writing techniques and strategies to communicate important things about ourselves in a small space. The workshop was presented by a writer and publicist, so you had the opportunity to get advice from both sides of the coin: the writing (technical) and the content (personal). It was an awesome event at the perfect price point. I really enjoyed myself and learned a lot. So, when a fellow fellow shared Bamboo’s Blog Like a Boss: Brunch Workshop, I was more than happy to attend. 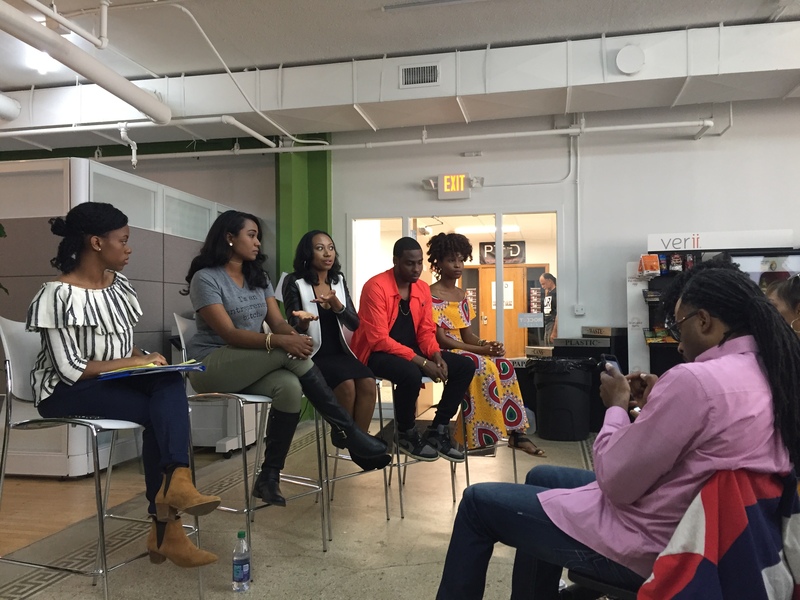 This event was hosted by JOURNi as a part of Detroit Tech Equity Week, and it was amazing! We learned how to improve social media marketing, strengthen a brand, increase followers, create interactive content and convert a blog into a sustainable business. This particular event was presented as a panel discussion…with a huge, amazing brunch spread to enjoy while the panel took place! The content aligned perfectly with something I’m working on at work right now, so I had a lot of takeaways. As crazy as life has been lately, I’m so glad I made a real effort to start attending these events. It has been really refreshing to take the time to do something for me, and the workshops have energized and inspired me. The positive outcome from my very first events will definitely help me stay consistent. Next up is How to Build a Powerful Brand Online!